“I still wouldn’t be that thin 6 months after I died”. A few aches and pains from the day before soon passed as the guys had a short 15 minute warm up to the first of the 3 climbs of the day. The boys hit the bottom of the Col de Chaussey, known as Lacet de Montvernier, with real enthusiasm. An absolutely beautiful climb with 18 switch back hairpins, with 400 meters of climbing in 4km. The boys were in top form and all felt fresh, which boded well for the rest of the day. Once re grouped, it was then on to complete the beautiful 14km climb from top to bottom, 1533m in height. The morning weather was cool, with a slight breeze…this was to change come midday. But for now, the boys pushed on well, Simon especially looked like a different rider. Once at the top, a momentous moment as Simon placed the first Peaky Climbers sticker on the Col sign. It was then over the top for a speedy descent down to La Chambere, the only incident on teh way down was Ben’s puncture. The sceneray was incredible, although the awful vertigo Mark was suffering from at every turn meant he had to descend at a sensible pace. Once at the bottom, it was time for a quick coffee, unfortunately no cakes were available, then it was back on the bikes to take on the big one! The Col de Glandon is a 20km ascent, averaging 9% and meant the Peaky Climbers would climb 1992m. 150 minutes of constant climbing, was tough enough…now the heat really kicked in. 97.5C, with no breeze, meant the jazz hands sun tans were guaranteed. Regular water stops at the now named ‘Haly Troughs’ were critical, whether filling up the bottles or dunking in headfirst. Food was now playing a critical part. The guys made a fatal mistake by not stopping for a proper lunch at the previously agreed time, but instead continues the climb. Cricky had no food and energies were fast depleting, with the team sharing food it meant by the time they were 3km from the summit the guys were ravenous. Macca bonked, but continued with the support of JB, Cricky chaperoned Simon and Ben stubbornly pushed on. The last 3km averaged over 10%… but wow, what an incredible achievement getting to the top. On the ride during the day, after cycling through a picturesque French village, as we approached the final climb, the photo on the left was snapped. Fabrice, the new Peaky Climbers BFF, because his tuck shop was like a mirage and just what the boys needed. 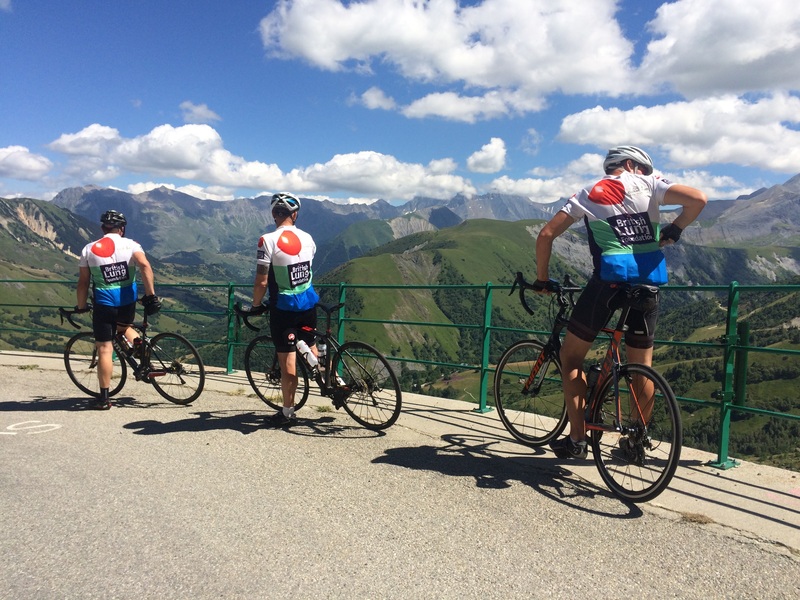 The guys consumed copious amounts of crisps, chocolate and Coca Cola, before the obligatory team photo and then proceeding to take on the Croix de Fer This climb was a real respite, 3km at around 5%, ensured the guys beat out a superb rhythm to the top. At last, on the decent, the guys finally stopped for some very late lunch. A beautiful location, helped the guys gorge on omelette, chips and local bread…topped up with Coca Cola. Once eaten, the talk turned to time left in the day v cycling left to do. A few minutes later, the team all agreed to push on and take on the last climb of this training camp, Le Toussuire. Again, this was a relentless and very challenging climb. Kilometre markers helped for the first 10km, then disappeared as the guys took a slight wrong turn and an alternative route to the summit. It was unrelenting at times, long tough drags up steep inclines with the later afternoons sun still glaring into the teams faces. After arriving at the top, the guys grabbed a very quick celebrator beer before heading down the 15km decent back to our hotel.